On Tuesday the 26th September at the Labour Party Conference a motion was passed unanimously. The motion included a call for a defence of the NHS in England and a move to reinstate the NHS 'as per the NHS reinstatement Bill'. Both speakers are members of Keep Our NHS Public: Alex Scott-Samuel from Socialist Health Acssociation and Doctors for the NHS proposed the motion which was seconded by Sue Richards of Islington CLP and executive member of KONP nationally. The motion - Composite 8: NHS was introduced by Alex in a moving speech in which he named accountable care systems and ACOs as a dangerous structure for healthcare. He described how they would lead to a restricted access to a diminished range of services – the inevitable result of the imposed, disastrous £22bn of underfunding of the annual NHS budget by 2020/21. His full speech can be viewed in the above video starting at 1:07:55 or here. Sue followed Alex by reminding Jon Ashworth, Shadow Secretary of State for Health, and Conference that this was one year on from conference committing to reinstating the NHS fully. Highlighting that the pledge had not materialised in shadow team policy, including at conference. Her full speech can be viewed above starting at 1:14:37 or here. A 'very well done' and so many thanks to Alex and Sue for all their hard work. The policy as agreed would end the era of privatisation, end the market in the NHS, both internal or external, end use of new PFI contracts and bring back under public control the current PFIs used to extract profits from NHS core funding that are undermining the stability of so many NHS hospitals and trusts. For more information on KONP's view of this wonderful motion please see co-chair Tony O'Sullivan's post "Historic moment as Labour Conference unanimously recommits to restoring an NHS for all". Thank you to all the campaigners who have contributed to this exciting development. We must continue to follow up the above important developments in discussions with the Labour shadow team and in campaigning up and down the land. 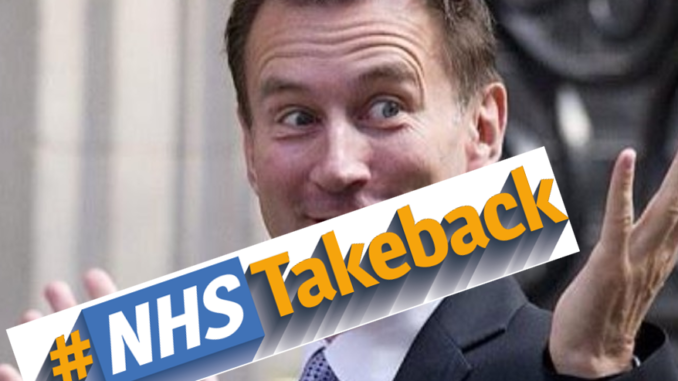 #NHSTakeback was launched by the We Own it Campaign on the 16th September and has the full support of Keep Our NHS Public and Health Campaigns Together. On the back of the incredible success of the campaign to stop the privatisation of NHS Professionals (see notice below) We Own it have created a 5 point pledge based on the content of the NHS Reinstatement Bill (the draft legislation capturing what we need to take back our NHS fully into public ownership once again – out of the hands of privatisation – in the spirit of 1948). The pledge also asks MPs to stand four-square behind a fully funded and well-resourced NHS NOW and a future with Public Health and social care integrated with the NHS. These can be found in more detail on their website. As of 6 October 26 MPs have signed. Ask your MP - you can write to or visit your MP, giving them this document to sign. Help us to takeback our NHS! 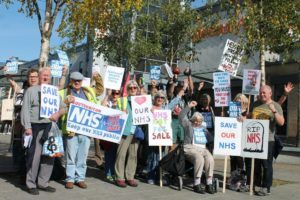 See Co-chair Tony O'Sullivan's write up on what impact this could have on the NHS in his post "Labour Conference – get MPs to pledge support for #NHSTakeback". On 25 July KONP members from Islington, Lambeth and Save Lewisham Hospital Campaign accompanied members of We Own It in delivering their petition to keep NHS Professionals public to the Department of Health, it had 16,400 signatures. Thanks to them and the campaigning efforts of many groups and individuals across the country, and pressure from shadow minister Justin Madders, the Department of Health announced on 7 September that they have dropped the plans to privatise the employment agency, commenting that NHS Professionals will stay “wholly in public ownership”. Proof that campaigning works! On 4 November, and following on from organising the #OurNHS biggest ever demonstration for the NHS with People's Assembly, Health Campaigns Together will be hosting a Campaigner's Conference - once again in partnership with PA. It will be a chance for campaigners to meet each other, share tips and find new friends. Don't miss out on booking your place! 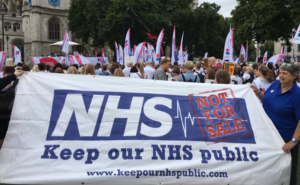 Please email materials@keepournhspublic.com or healthcampaignstogether@gmail.com for free leaflets to advertise the event in your local area. Many of you will know Alan Taman who has been KONP's communications and media officer for the last couple of years. Alan is leaving KONP to take on a PhD at Birmingham University, though he'll still be working for Doctors4NHS and Health Campaigns Together so assures us this is not goodbye forever! Many thanks for all your hard work Alan and the very best of luck for the future. For the next few weeks Vicky Penner has agreed to take on Alan's media and press duties. She can be reached at vickypenner@gmail.com or on 07770 941337. Thank you Vicky and welcome! 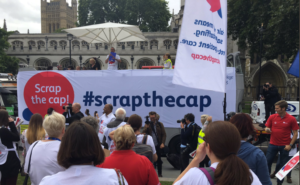 On the 6th September nurses, health professionals, health campaigners and members of the public came together in London's parliament square to support the Royal College of Nurses' 'Scrap The Cap' protest against nurses' longstanding 1% pay cap. A few months ago it was reported that the number of NHS nurses receiving hardship grants was up by 200% showing how important this issue is. 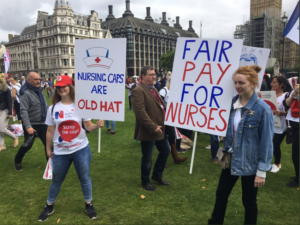 Even so, Theresa May has commented that a decision to give a pay rise to nurses would be spending money on 'this that and the other'. Campaign Group 'Keep the Horton General' has won an important first step in the battle against the downgrading of Horton Hospital. Judge Fraser today granted permission to apply for judicial review of the consultation process. 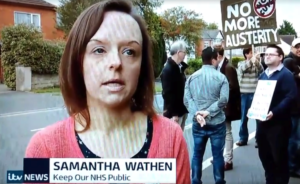 We commend Keep the Horton General Campaign (not affiliated to Keep Our NHS Public but they work closely with Oxford KONP members) on their courageous and stubborn efforts to save the Horton General hospital. Well done to everyone involved! The People's Assembly Against Austerity have reported that 50,000 protesters marched in Manchester on 1st October against austerity, cuts in public services and public sector pay cap. Keep Our NHS Public was there to join in that call for he NHS, its services and staff. Next step: come to the Health Campaigns Together conference supported by People's Assembly on 4 November (see above). 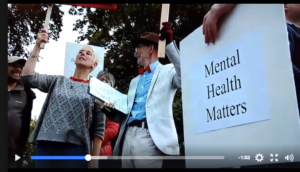 Swindon KONP have done remarkable work in fighting to stop the closure of the mental health emergency assessment unit in Swindon. Samantha Wathen - Chair of Swindon KONP - was interviewed on BBC radio Wiltshire for their lead story. They also appeared on ITV West Country and BBC Point West. 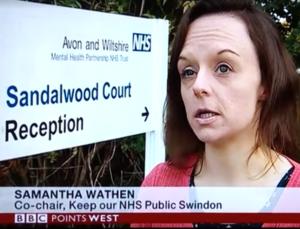 Last year AWP (Avon & Wiltshire Mental health NHS Trust) decided to close Swindon's only Place of Safety 136 Facility (Sandalwood Court), and the one in Salisbury, to have a centralised hub at the Green Lane site in Devizes. The consultation has opened and closed a couple of times, most recently closing on June 16th. We have been in touch with both local Conservative MPs who are helpfully in favour of retaining the facility and have lobbied at a higher level. This closure would mean a 45 minute trip each way for service users in crisis. In addition, due to staffing issues in the police, especially at busy times, patients may be inappropriately detained in police custody if there is insufficient time to make the 90 minute round trip. Our local ambulance service is also grossly overstretched, often having to heavily prioritize calls, so they similarly do not need the extra pressure of transporting patients long distances. Service users will also be away from the people and places that are familiar to them when they are at their most vulnerable, only in many cases to be transported back to Swindon after their initial 136 assessment anyway. Because of all these reasons we decided to stage a protest outside the venue last Saturday (23rd). We were attended by about 25 people who consisted of group members and representatives/members of local mental health organisations. Most notably Ann Mooney who runs the Service User Network Support (SUNS) charity. This group have been campaigning for Sandalwood Court right from the beginning. We were very well attended by local and regional press. 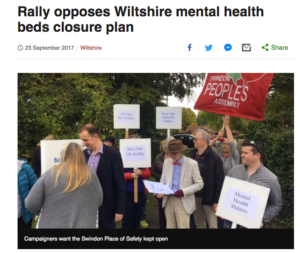 In the morning I highlighted the issue on BBC radio Wiltshire, and both BBC and ITV local news channels were in attendance, with pieces that went out that same evening. Indeed, we were the top story on the ITV West Country TV bulletin. The Swindon Advertiser also covered us in two separate reports. AWP were scheduled to discuss Sandalwood Court at a meeting on Wednesday, however the decision is now on hold, due to be discussed at an as yet unknown date in October. I received this information late last Friday night. Our demo was known of then but had not yet happened. It is impossible to say for sure how much Swindon KONP has swayed the AWP, but I definitely think we have helped pile on the pressure to hopefully make the trust reconsider this foolish decision. Indeed, I think (and hope), that particularly our television coverage has at least highlighted this issue more widely and made them think. We will of course continue to monitor and campaign on this issue, and I am currently forging deeper links with other organisations locally in the hope that our combined efforts will bear fruit. About 30 people marched 4 miles from St Mary's Hospital, Newport, Isle of Wight, to the ferry terminal. A few of them came to Southampton where a number of demonstrators waited for them. 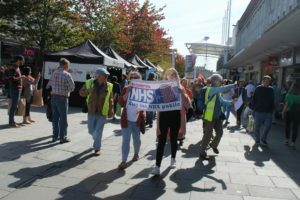 The protestors walked through the city centre, had a picnic in the park, made their way to Shirley precinct and marched to the General Hospital, giving out leaflets all the way. The reason for this? Cuts to heath services provided in St Mary's, which will force people needing treatment to go to Southampton General Hospital, increasing the workload and stress of staff here as well as the waiting times. Great work to all who were there on the day. #ourNHS is the most beloved British institution in our history, so what has brought it to a humanitarian crisis? 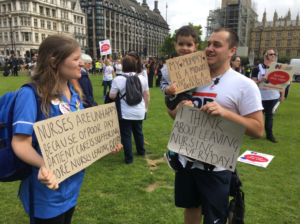 NHS staff are struggling to cope with the NHS collapsing around them, suffering up to 25% pay cuts and thousands are either leaving or forced out on strike. Please come along and listen to first-hand accounts of NHS staff right at the frontline, battling every day to uphold your right to universal healthcare, free at the point of use. This is everyone's fight. Join us. Health Campaigns Together are hosting the “NHS in crisis: FIGHTING BACK TO WIN” campaigners&apos; conference in the town hall at the centre of the local authority refusal to accept the dreadful consequences of STPs for local health care. Get tickets now. Accountable Care Systems (ACSs) will be the organisations deployed to implement NHS England’s 2014 Five Year Forward View and the 44 Footprints’ Sustainability and Transformation Plans (STPs). This free-to-attend event will explore the nature of ACSs, share ACS experiences in England and abroad, debate expert opinions on Capitated Budgets, simultaneous integration of care services and cost cutting, and barriers to progress. It will examine alternative approaches to integrated care services delivery. There will also be a review of the software tools needed for clinical data sharing, medical records’ sharing, activity based costing, reporting to patients, and the data analysis needed for successful ACS operations. More to come soon here. We will be getting the next edition of the HCT newspaper on Friday 6th October. Please order via our online shop or email materials@keepournhspublic.com.